[SALE] California to Hawaiian Islands for only 12,500 Alaska Airlines Miles one-way! Whenever I tell people I travel for free I usually get this response, “well, food and drink isn’t free when you are traveling”. While on a three-hour layover in Portland, we did “travel” for free, and then some. Portland airport is a great exception when it comes to the Priority Pass membership. Most airports have only one or two priority pass “contracted” lounges that allow you to comfortably kill time before your flight. In the past few years, Priority Pass has added a number of restaurants to their ‘lounge’ directory, Miami and Denver most recently. 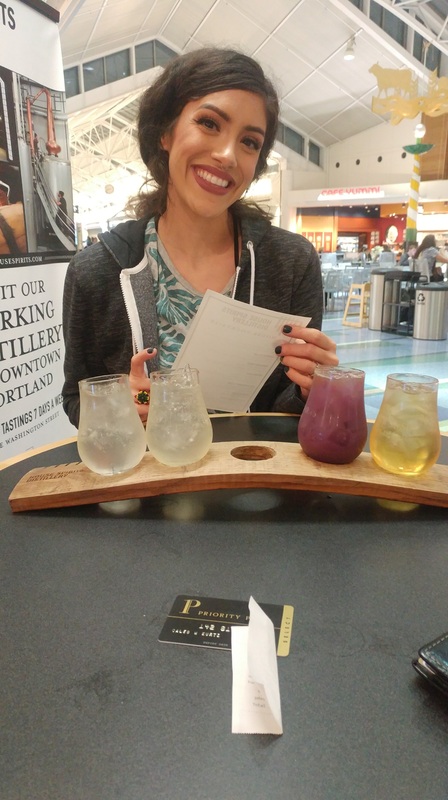 In Portland, there are three establishments where you can use your PP membership for food and beverage, in addition to the Alaska Airlines lounge. 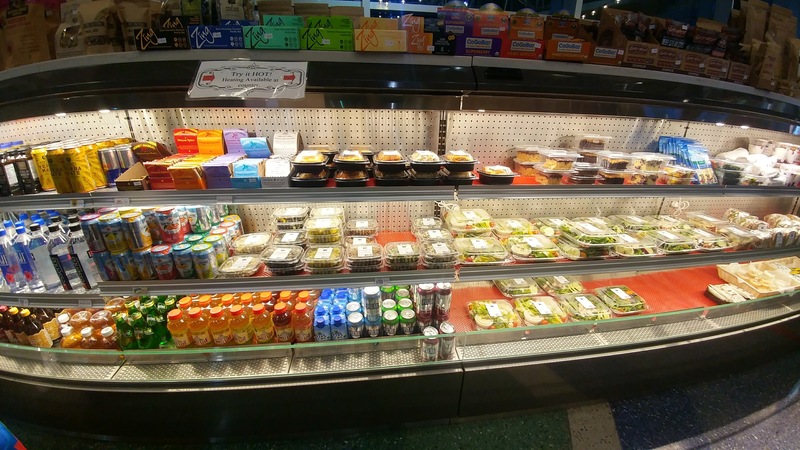 As soon as you exit security into terminal C, you will spot Capers Cafe Le Bar. This is a full-blown restaurant that is part of the Priority Pass collection. Your benefits, if you hold a PP Select membership, entitle you to $28 in credit towards food and beverage per person. We notified our server that we’d be paying with Priority Pass before ordering, which is required. The server let us know that we could each spend $28 or a collective of $56, however you dice it. The only thing excluded was alcohol TO-GO, you can drink while seated. 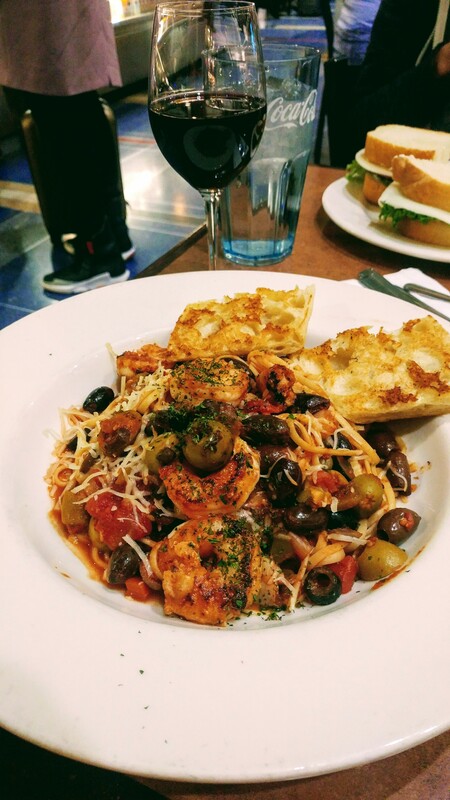 I ordered shrimp pasta and a $9 glass of wine. Alyssa opt’ed for a sandwich, nothing too crazy. Our bill was at roughly $44 when the waiter asked if we wanted to take some cookies to-go since we had some allowance left, we both nodded. $50 before tip. The tip must be left in cash/card, it cannot be billed to Priority Pass. The Capers Bar in terminal D is another place to stop and score some free goodies. There is a bar and a large selection of gourmet snacks, drinks and food. You can purchase ANYTHING using the $28 credit minus alcohol bottles to go. This booze-to-go exception changed very recently thanks to so many people grabbing booze on the run, who can blame them. As we browsed all the goodies, a Capers worker approached us and asked if we were paying with Priority Pass. He said they get 30+ people per day maximizing their credits on free goods. He gladly swiped our Priority Pass card and helped us get all the way to $56 without going over. Remember, there is no sales tax in Oregon. We browsed cheeses, jams, honey, coffee, smoked salmon, chocolate, you name it. We grabbed some snacks for the red-eye to Boston and it rang up at $55. We were set on snacks for a while. 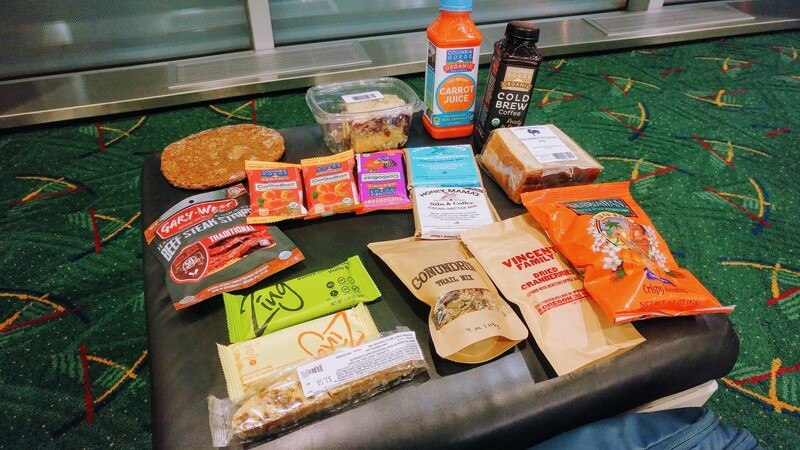 Scoring $55 in free treats before getting on a flight is always a welcome bonus. Adjacent to gate C6 you’ll spot House Spirits Distillery, another joint to cash-in your $28 per person credit. This time, you’ll have to drink your Priority Pass benefits. As a loyal blogger, I felt it was my duty to sample these offerings and share my feedback to you. They were delicious. Again, no to-go items or merchandise will qualify, you have to sit-in and consume their drinks or samplers. We opted for the ‘flight cocktail’ which rang up at $20 flat. After enjoying the sampler we ordered three more drinks at $6 a piece. $38 in drinks, tip not included. If two people are able to consume $56 in alcohol from here, more power to you, we aren’t that seasoned. As previously mentioned, you can score a PP Select membership by signing up for a number of premium credit cards (read: high annual fee). Most notable are the Chase Sapphire Reserve, American Express Platinum, and Citi ThankYou Prestige. What I found interesting is how well aware the employees were of the Priority Pass rules. This was not their first-rodeo so you can bet a number of people are maximizing this perk as we did. Almost every employee we interacted with kept reminding us that we had “more to spend” before hitting our collective $56 cap, a challenge we did not accept with alcohol. The real beauty here is that you can use these benefits on departure AND arrival, no boarding pass is scanned. Being Sacramento based, we often have to position to find good deals on airfare. Portland is most certainly going to be high on the list to layover as we can utilize up to $168 in perks each time we connect, not bad. Remember, you can access the entire airport without leaving security, if you are short on time you can still squeeze in all three stops.